New grant awards and technologies are helping researchers at the Virginia Institute of Marine Science redouble their efforts to better understand and manage potentially harmful algal blooms in Chesapeake Bay and coastal waters around the U.S.
All told, the grants total $2.5 million over three years, positioning VIMS as a major player in the nationwide effort to unravel the many intertwining factors that control the onset, duration, and toxicity of harmful algal blooms. These ‘HABs’ are of growing concern not only in the U.S. but worldwide, as global warming and nutrient pollution contribute to algal growth in inland and coastal waters. Two of the grants—earned through NOAA’s ECOHAB program—support studies specifically targeting species implicated in previous harmful algal blooms. An ECOHAB grant to VIMS professor Kim Reece and colleagues will help investigate Alexandrium monilatum, a species associated with mortality of marine finfish and invertebrates along the Gulf Coast and more recent mortality of oysters and oyster larvae in Chesapeake Bay. 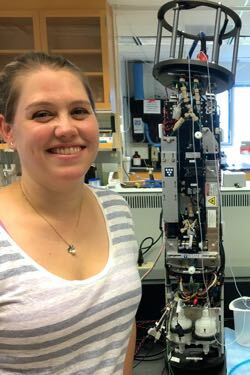 A second ECOHAB grant, to a multi-institutional team led by VIMS assistant professor Juliette Smith, will support developing early-warning systems for HABs in major shellfish harvesting sites in Chesapeake Bay, Long Island Sound, the Gulf of Mexico, and Puget Sound. The team’s research will focus on Dinophysis, a group of algae known to produce toxins that cause diarrhetic shellfish poisoning. 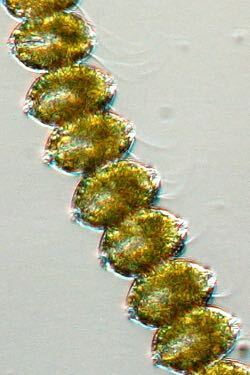 Dinophysis species have threatened shellfish consumers in Asia and Europe for decades, and have more recently emerged as a threat to human health in Texas, Washington, and New England. Chesapeake Bay and the mid-Atlantic are new areas of concern, as they harbor toxin-producing species of Dinophysis, with evidence that impacts to human health may soon emerge. 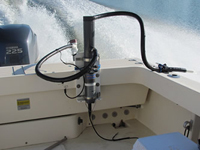 Smith’s Dinophysis research at VIMS will benefit from the planned mid-October deployment of a privately funded Imaging FlowCytobot—an automated, submersible instrument that can capture images of individual algal cells in real-time, and be programmed to identify these cells to species level. “The cytobot will help us develop early warning systems that coastal managers and growers can use to ensure shellfish safety and protect human health,” says Smith. It will also advance the team’s broader goal of identifying the environmental factors that control Dinophysis blooms and toxicity within and across regions. Another major grant, from the National Science Foundation, will fund research by Dr. Iris Anderson and fellow VIMS professors Mark Brush, Kim Reece, and BK Song. Their goal is to better understand and model how algal blooms affect the cycling of carbon through estuaries like the York River. Scientists now suspect that these ecosystems—where rivers meet the sea—play an outsized role in determining the fate of carbon released by humans through the burning of fossil fuels. Song’s part in the NSF grant is to examine the role of bacterial communities in metabolizing the organic carbon released by blooming algal species. The group’s ultimate goal is to determine whether this complex interplay makes the estuary a net sink or source for atmospheric carbon dioxide. They also hope to understand the degree to which organic carbon derived from blooms accumulates in estuarine sediments, where it can result in low-oxygen conditions and accelerate the release of nutrients, promoting eutrophication. Measurements from Dataflow also help delineate bloom boundaries. Brush says "Determining the spatial extent of the blooms is critical to our efforts to model the effect of the blooms on the York River ecosystem." His role in the project is to use field data to fine-tune an ecosystem model to better understand the conditions under which these blooms occur, and to quantify their impacts to the ecosystem. In addition to Dataflow, the research team is delineating bloom boundaries using imagery collected by aerial drones operated by VIMS assistant professor Donglai Gong. Although not formally supported by the current NSF grant, Gong’s drone operations hold great promise for HAB research, and will likely be included in future funding proposals from researchers at VIMS.